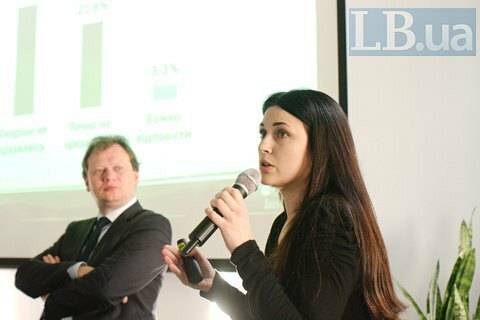 The social democratic ideology as a "golden mean" enjoys the highest support among Ukrainians, according to the findings of the nationwide public survey, "Ukrainians' attitude towards social democracy", presented today by Svitlana Balyuk, head of research at the Gorshenin Institute think-tank. "Conclusions of the sociological survey carried out by Gorshenin Institute in partnership with Friedrich Ebert Stiftung Ukraine & Belarus show that Ukrainians (47.7%) are interested in politics. There were people in focus groups who said they did not care about politics but they still admitted that it is impossible not to take interest in politics in Ukraine," she said. The expert added that based on the findings, most Ukrainians have no clear understanding of ideologies, including of social democracy. "At the same time, the majority of Ukrainians believe that the state must ensure decent living for citizens. One in three people said that the state must set unified rules for all and check their observance. Only one in 10 answered that the state should intervene in citizens' private life as little as possible. Our expectations as regards the perception of ideologies proved true. The majority of Ukrainians has vague ideas about the subject. Nevertheless, based on available answers, Ukrainians, to a certain extent, gravitate towards centrist views while social democracy as a "golden mean" enjoys the highest support in Ukrainian society," she said. Social democracy is particularly popular with people aged 45 and more who live in eastern Ukraine. The study involved five focus group discussions and 2,000 interviews with respondents.